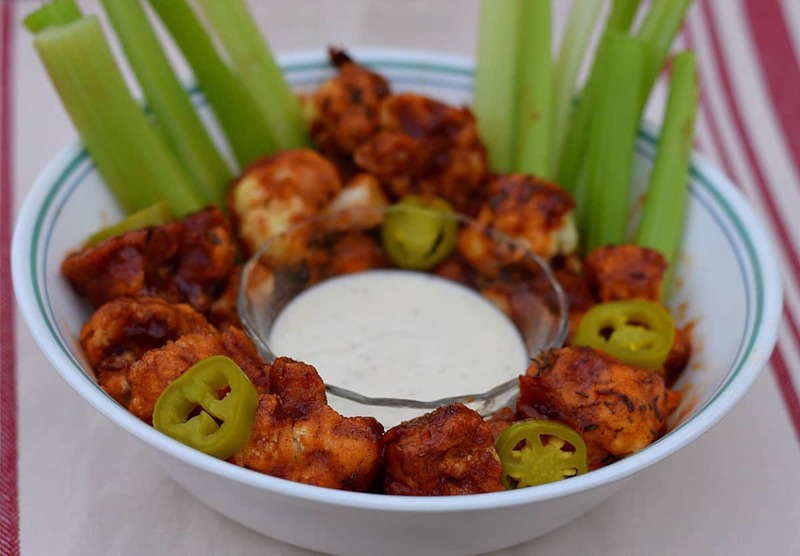 Summertime BBQs are here, and these BBQ Cauliflower Wings will be a great addition to any party. These wings are batter dipped and then baked to a crispy perfection, perfect for slathering on your favorite BBQ sauce. My wife came home with yet another head of cauliflower yesterday – not knowing I had just bought one myself. All of a sudden, dinner looked liked it was definitely going to include cauliflower. Not quite Scooby Snack material….but definitely snarf worthy. 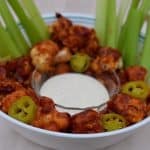 To make these yummy BBQ Cauliflower Wings, we’re going to break up one small head of cauliflower into bite sized florets. We then hand dip them into a homemade batter and then bake them in a 450° F oven for 15 minutes or until golden brown. Once baked – try not to eat them all before slathering on your favorite BBQ sauce because yes – they are THAT good even now. Carefully coat your ‘wings’ with your favorite sauce and bake for an additional 5-10 minutes. The sauce you use it totally up to you, although I highly recommend my homemade BBQ Sauce I use in my BBQ Soy Curl Recipe. It’s sweet and smoky but has none of the HFCS you’ll find in store-bought sauces. For a quicker option, I have used Stubbs Sticky Sweet BBQ Sauce and it’s also very good, and has no weird chemicals. However, as the name implies.…it IS sweet. You can find it at your local grocery store or the affiliate link to Amazon I included here. And as for dipping? 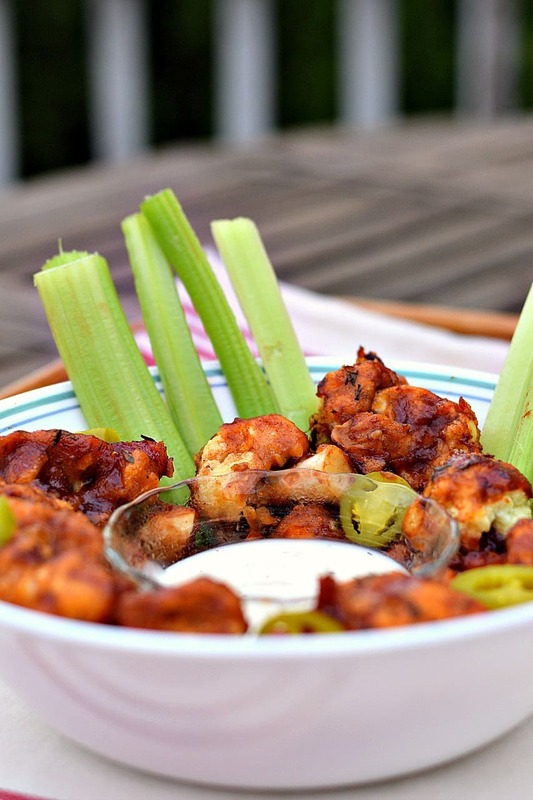 Although totally optional (because these wings are very good all on their own) I highly recommend serving them with my Cool Vegan Ranch Dressing. Remove from oven and using tongs, carefully dip each cauliflower byte in the BBQ sauce. Garnish with celery sticks, carrots sticks, and our Cool Vegan Ranch Dressing. I made these with Frank’s red hot sauce instead of BBQ tonight. They were crunchy and delicious. Thanks for the great recipe! I made these last week. Is the batter suppose to be super thick or somewhat thin? It was so thick that it was hard to coat them. If it’s super duper thick – you can always thin it with a bit more Almond Milk. Should have the consistency of pancake batter…..a little thicker would be ok.
mine is never crunchy, the cauliflower always soft, i tried 400F and 450F but had the same results. Any ideas?